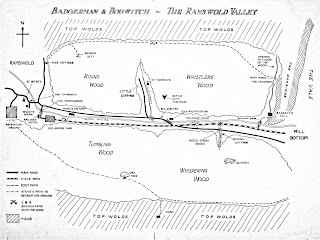 I am happy to have spent the morning deep in the Ramswold Valley! Good to be back where I belong. A new book to write. Batteries recharged. Mind, you I nearly started writing another thing entirely. Time will tell whether I chose wisely! No more elation until I finish. An odd case of mistaken identity. After two months off, I have started writing again. 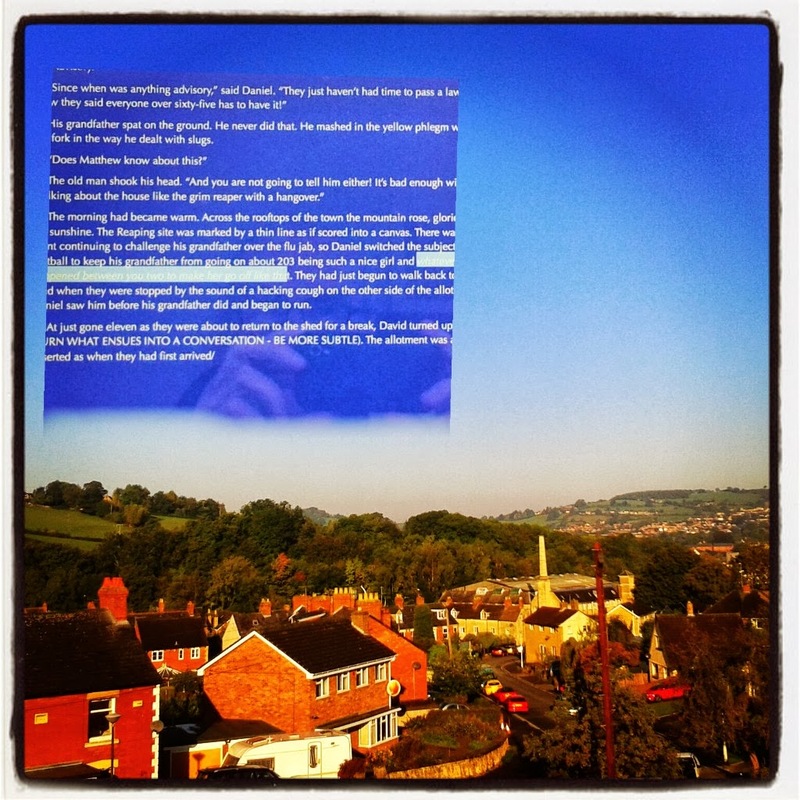 This week I started reworking my book for 9-12s, The Tall Story of Tiberius Small. This was the one which was politely declined by a eleven agents in 2013. (Four never replied). I received one very kind 'near miss' amongst the correspondence. Now that I have abandoned the idea of changing my name to Jackie Durango, 35 year old mother of two from Chiswick and dismissed all notions of there being ageism in children's publishing as a sad delusion, I feel ready to start work again. I have begun by modifying the title. My book has become The Tall Story of Tobias Small. I think this is better, but time will tell. Thank goodness for global find and replace. I shall be changing more names, but this is less important than developing character, narrative voice comedy, place and other things. Why am I doing this? Because I believe the heart of the book is sound. I have the faith of ten Ray Bradbury's. I am working without the benefit of an editor in a world where, for an old hand like me who has been published three times and remaindered, a book has to be tuned and polished before it will be taken seriously by anyone who wants to make money out of it. There is no leeway for someone who has been there before. If you fiddle Rome will burn. The thing about creating any piece of work is knowing when to stop and let it go. 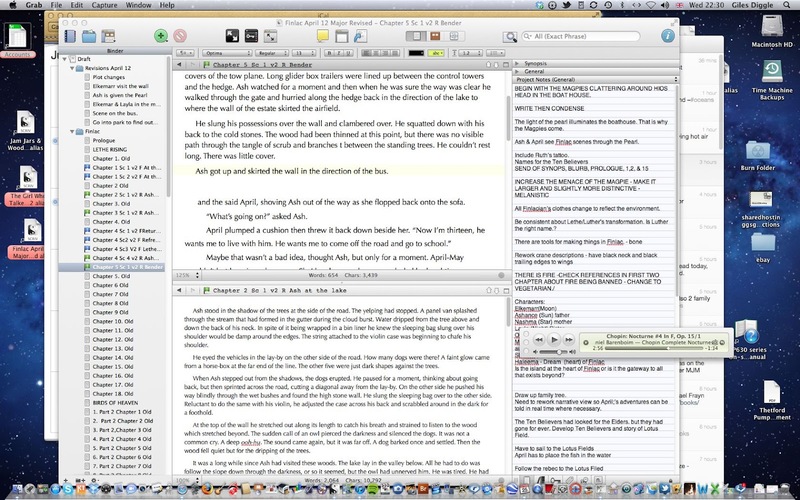 ebooks allow for any amount of post-publication fiddling and revision. Letting the work go has to be a matter of self-discipline, self-belief and an acknowledgment that it was how you saw things at the time. After the event if you see the world differently, then create something else that reflects that. Let's not be lazy. 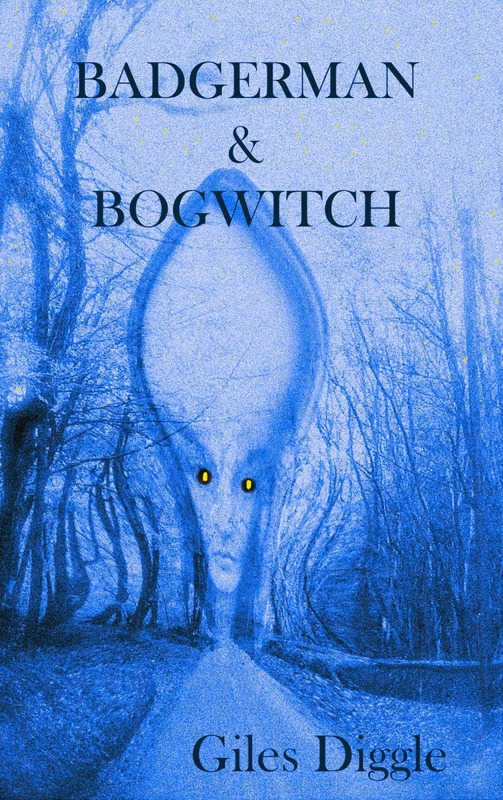 When I came to think about the ebook of Badgerman & Bogwitch, I initially saw it as an opportunity to update it, if not significantly revise it. I fiddled around with dates and updated the book to reflect the changes in technology in the twenty years since I began to write it. But in the end what I realised was that making it more contemporary added nothing to the power of the story, so after a few months fiddling and reformatting, I went back to the original text. I am happy with that. 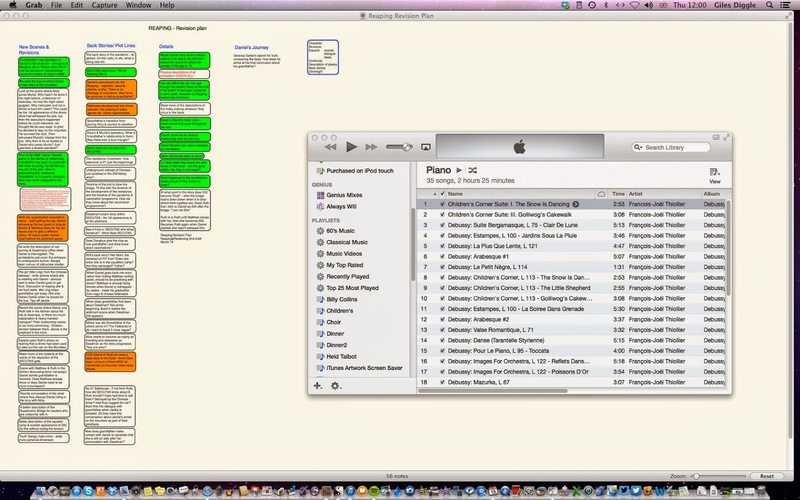 It helped me focus on my new projects. 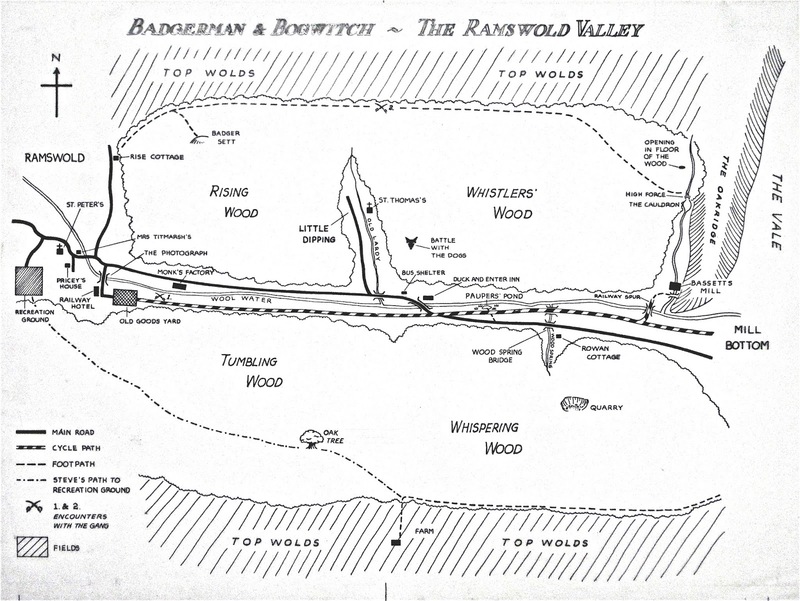 At the end of the day the electrification of Badgerman & Bogwitch was a technical exercise. I learned a lot on the way about the new format. I am still learning how to manage the book once it is on line. I have dipped in and out of publication on Amazon - I have deleted my own book from the list - and made it available as a free download on my website. I am about to distribute it more widely for free through Smashwords. Having said all, this I have revised the cover. I have returned to my favourite colour: blue. An ebook is a lost child in a soundproof warehouse run by robots. Why doesn't anyone under thirty think print books have a future. Why hasn't my blog views' counter moved in the past four days? Should I really look at Google Analytics to see how my web page is doing? 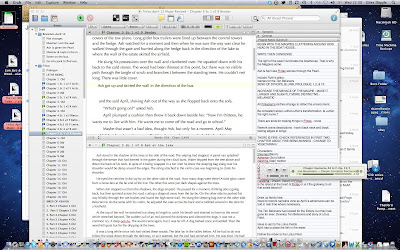 Should I be writing more than 1000 words a day, and an additional day a week? Do I bore my Twitter followers? Do they care enough to be bored? Should I get into Linkedin, Facebook, Google+ and Pinterest, and......? Do I have time to make a splash on Goodreads? How do I stop myself looking at Amazon's Daily Deal? Why are agents always looking for new writers, not old ones? Should I give my ebooks away for free? Everyone else seems to be going to writers' conferences. How many self-help ebooks does one writer need? Should I stop buying on Amazon and support my local bookshop? How can I compete with those who turn out 5+ ebooks a year? Why am I not interested in zombies, vampires and life after the apocalypse? Publishing an ebook is like abandoning a small child in a soundproof warehouse run by robots. Why can't I take myself more seriously? Lucky 13: Premises that underpin my writing. It is not a competition. The only person who can defeat you is yourself. Success is not measured in money; or by being traditionally published. Don’t expect to make a living out of it; the world doesn't owe you one. You don’t have to enjoy writing, but it helps if the balance is at least 60/40 in favour of happiness. Social media is not writing; turn it off when you are working. Every blank page has a story to tell. Write and it will speak to you. What you have written is your legacy. A writer who doesn’t write is lazy. Keep a notebook; you can work on more than one project at a time. Like food & exercise, little and often is best. REMEMBER: Everything you write will burn up one day in one sun or another. When a miss is as good as a smile. The smiling villains are in politics. I don't think of literary agents as people like that (though I imagine those in that line of business could probably come up with a name or two). It's not been my experience anyway. Like most people they are doing a difficult job in trying and ever changing circumstances. This is my Wind in the Willows view of the world. The smile then. Well, yes, an actual personal email from a well-known agent. Alas: "There is an awful lot I like about it." (The book) .... "I’m sorry that it’s been a near miss for me." a) It's not a pro-forma rejection - death by a thousand cuts. b) The book is along the right lines - it may be publishable but not in these dark competitive times. It is not a slam-dunk, it is the basketball spinning around the rim of the net. What would Tiberius Small do? Well he is tall enough to slam-dunk every time & if by some fluke he did miss, I guess he'd use one of his many connections to make sure he stayed on the first team and took all the plaudits in the school newspaper, if not the Sunday Times. But that's another story? Me? I'll go on submitting, (but not in the passive sense) until I find the right fit, either with The Tall Story of Tiberius Small or another book..
Have you seen Tiberius Small? So what's happening with Tiberius Small, the six foot ten year old with the loaded gun and 2.5 million stolen Euros? You'd thing a boy that dangerous would have a load of people after him! Well, he hasn't been caught yet. He's still out there looking for a new venture. In fact even though he's six foot tall he has to jump up and down to get noticed. Actually a couple of agents did catch a glimpse of him. I guess they shook their heads and said, "I do not believe it!" I reckon Tiberius Small will just have to leap higher and wave his arms around more vigorously. After all he is a boy who never gives up. Early days. I have sent Tiberius Small to act the fool in front of three other agents and I am looking for others he might entertain. Success is all in the luck and timing (and having a good book in the first place... that fits). After all my first book Inside the Glasshouse was rejected by 12 publishers before it landed on Christopher Reid's desk at Faber & Faber and he liked the idea enough to develop it with me all those years ago. Had it arrived a week later ... or he'd had a headache... who knows? The same goes with agents I guess. A brave thing to go back to the first draft of a book after a year's absence? It's loaded onto the Kindle, ready, but I have just put it down to write this, prompted by the first section heading: Nightshade. I don't even remember writing that word. This may be a good omen, indicating that I shall be able to stand outside the story and see it afresh as others might view it. On the other hand. like places and things in childhood the story may turn out to be smaller and less wondrous. Like favourite holiday destinations it may have suffered over the time and be almost unrecognisable. These are the risks that come with committing a chunk of one's life to writing something you hope will be enduring. It is not an exciting prospect, but hopefully after the examination there will be exhilaration. Then relief. It will be short lived. Doubt will creep back in on taking a third look at the book. So I shall revise it a fourth time until I reach the point where I think it is time to let it go. Hopefully. So it is now May. I went to Australia for much of March and April. I meant to look at my final draft while I was away, but I just let it sit, knowing that it was pretty well finished. On my return I read it though once again and made one or two minor changes, sharpened a few sentences and checked it for continuity. The Tall Story of Tiberius Small is finished and weighs in at 37,000 words, which I hope is about right. Nine and ten and eleven year olds should be able to read it as long as they are due to hit Level 4 English and have a sense of humour... and still like books. What do I really know? I enjoyed writing it and I am not embarrassed by any of it... so... time will tell. For the moment I am a success. Tomorrow? Am I heading for a fall? Whatever, I am thick skinned. It is done. I have pressed the Send button. I am right back where I was when I started this blog about three years ago. I am waiting for the joyous Ping! of acceptance arriving in my Inbox. Why writing is all Snakes & Ladders. I am pleased to say I have just finished adding the final touches to my new book (Title remains a secret). I can now have a break. In just over a month's time I shall have one last look at it and then send it off to agents. I shall then have to go back and look at the first draft of a book I finished this time last year. (Title remains a secret) When I'll look again at The Key to Finlac, I am not quite sure. I have a long version, and most of a shorter version ready. Why do titles remain a secret? I guess because until I send a book off, I have not quite settled on it and don't want to give too much away. So how do I feel about my progress towards being published again? Sanguine I guess. I have written at least 40,000 words a year for the past three, so something might happen in the end. I know I am a good writer. So much depends on the market... and getting past the intern at the door! In October, I shall start a new project. I know exactly what it is. At least for the moment, I am at the top of another ladder! I have been busy. On 3 October, I started writing a new book (That's three now in various stages.) 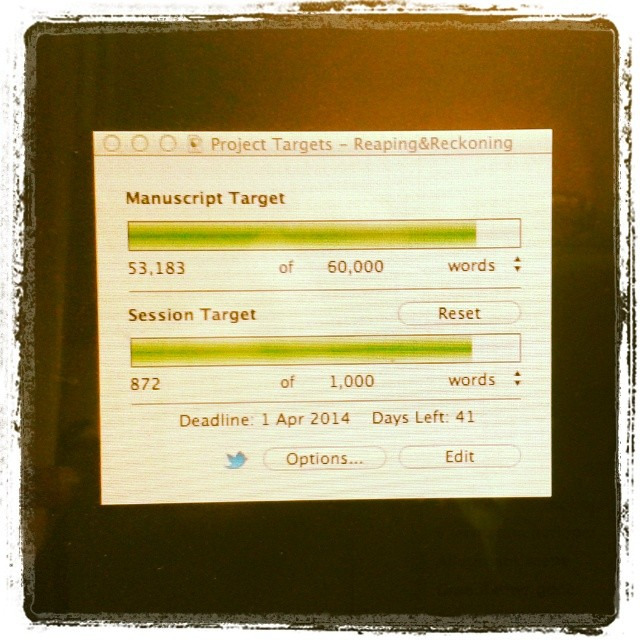 I've been feeding my 1000 words a day habit and am 10,000 words from finishing this first draft. As I knew I would eventually, I have stumbled this morning and only managed 300 words, which is why I guess I have turned to this blog again. I have spent the last six weeks or so (at least for 3 hours a day) seeing the world through the eyes of my ten year old self. I have managed to amuse myself, so I hope my book might entertain others. A 10 year old is a 12 year old is an 8 year old is a 10 year old. I don't really believe one generation of children is much different from another when you scratch the surface. Now with just 10,000 words to go (Ten days - that is the way I measure things, like small children counting 'sleeps') I have to pull all the threads together and leave no loose ends, except maybe one or two that I can pick up in another book. Funnily enough I photographed another rainbow today. It was one of those complete ones, where you could see both ends, but is impossible to photograph without a super-wide angle lens. (Which is why we have an imagination and a memory.) It boded good weather for birding... and as it turned out for writing too. I have been making notes for a number of days - off and on - but just before lunch I began to write the new book. I have spent three hours writing 250 words. That seems like a long time spend with little to show for it, but I have been working carefully to find the narrative voice and set the tone. I think I have gone some way towards finding them. I have set the two main characters up and now I shall let them run and see where they lead me. Optometry & Optimism - seeing the road ahead. This morning finds me a happy man. 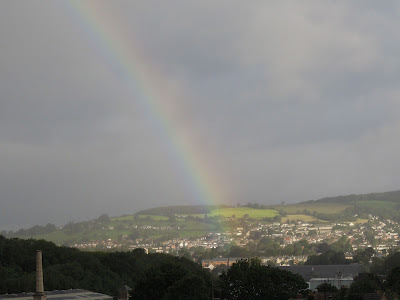 A rainbow arcing over Stroud at 8.00 a.m. I have managed to remove 20,000 words from The Key to Finlac so far (over the summer, not this morning!) I am listening to the new Bob Dylan album and I have the title for the new book I have just started writing (not drawn from Tempest). It's raining. Less of a distraction. ... or should that be optometrist? I have four pairs of glasses: for reading, for reading in the sun, for watching tv & a pair for working on the computer. Make that five - sunglasses. Maybe six - rose-tinted. Why do I still use school terms for my reference points even though I am no longer involved in education? Like a dutiful school boy I still settle down to work every time a new term begins and kick off my shoes & go barefooted when end of term comes around. I never have been comfortable with the notion of New Year's Day or the beginning of the financial year in April. Spring & the beginning of the Summer Term has more significance. And then there is September, where it all really starts. New shoes, new uniform, new stationery; looking forward to kicking though the autumn leaves. If a painter can work on several pieces at once, then so can I - as long as there is an end in sight. That is the challenge. The juggling....but not as the mood takes me. It requires more discipline than that. Does not posting a blog recently mean I have been focusing hard on the book? Mostly. Writing the first draft of a book is like being a child again, running down the beach on the first day of the holidays to stamp my feet in the water. It's all shrieks and hollering. The second draft is shivering back up from the shore line, feet stabbed by stones. The final draft is being rubbed hard with a sandy towel. Warming, but unpleasantly abrasive. But there will be a time when the sun breaks through, and I'll sip scalding sweet tea from a Tupperware cup, hot sand between my toes. And I'll dream that dream of never going back to school again. This is my morning. Still working on the revisions to The Key to Finlac. Still trying to reduce the first 45,000 words to no more than 10,000. It's a tough call, but I'm, getting there. The question to be asked all the time is: What is essential to the story? If it doesn't move the narrative forward, leave it out. But it is also important to remember that 35,000 words have not been wasted. They have not been expunged. Not so much evaporation as distillation. I write this, so I have the heart to go back to the book again tomorrow. It's a reminder to myself as well as a glimpse into the writing process. Fortunately, I had produced a significant amount of writing yesterday, as well as making some important decisions re: the structure of The Key to Finlac. A day off then is excusable. Forensic has popped into my head this morning. Slow, methodical, painstaking work to analyse what has happened. What exactly is the truth of the story I have written? As another person, I have to go back to the scene and find out what really occurred there. What is still to be discovered? I have begun re-writing, The Key to Finlac, opening the book with an entirely new episode involving a character I knew little about before. And as I'm discovering, I had not properly explored and explained the world she inhabits. I have been looking for clues - trace evidence - and putting a credible scenario together to present to the reader. It is delicate work, tricky in that I have to tread carefully so as not to destroy or contaminate that which needs to be preserved. Without all the pieces, those already logged and those freshly seen, the story cannot be rightly told. What could possibly take me a way from me desk when I should be writing? I write in the morning I go birding in the afternoon, not necessarily the best time. Compromise. Yesterday I broke my habit. Avocets had hatched three chicks at WWT Slimbridge the day before. This is the first time Avocets have bred on the reserve, or anywhere in Gloucestershire. I felt an urgency to see them - history in the making - and via Twitter @slimbridge_wild I had an inkling that the parents were about to move them. I left home at 7.30 a.m. I wanted to capture the moment on video. I succeeded. You can watch it happening here http://www.youtube.com/watch?v=s1HX72-jtmo. Magical. The birds performed right on time, boldly leading the chicks across the water to a fringe of weeds on the other side. A meagre shelter. This just fifteen minutes before I was due to go back to Stroud. Jubilant, I went home and uploaded my video, then went into town for coffee. In the afternoon, comes another Tweet. The Avocet family had gone missing. Predated? Or in a place of safety? The wardens can't find them so the first seems most likely. Agony. Uncertainty. My video somehow has taken on the aura of CCTV images. Last known sighting. Life is more dramatic than art. Art distills its intensity and fixes it in the collective memory. The Avocets is a story in the making: a struggle against the odds creates a unique and thrilling event, then a mystery that we hope shall have a resolution. The Slimbridge Avocets & Me says it all about our need to hear a tale well-told, and in children's books, the desire for a happy ending... whilst allowing for the fact that life is often not like that. "We have found the male Avocet this morning feeding on the Top New Piece, but still no sign of the female and three young." "We hope that the female Avocet is being a good mum & keeping a low profile with her family. Let us know if you see her from our hides today?" "Great news it looks like the Avocet family has made it to the Bottom New Piece (Kingfisher Hide) That's about 300M from the nest site."10.45. a.m.
"Fantastic news all three Avocet chicks are still with their parents on the Bottom New Piece (Kingfisher Hide) this morning #GlosBirds"
I have killed off a brother even before the story begins. I have abandoned a set of parents. I have demolished two houses, a factory, and a school. I have remodelled a significant landscape. I have scrapped a motley collection of old vehicles. I have put a property developer out of business. I have removed one mystery and replaced it with another. I have added a new character and developed others. I have written a more engaging back story for my other main protagonist. I have done away with 500 years of history. I have mislaid a brew bin. I shall begin writing again tomorrow, having rewritten history today. Monarch of the Pen: The Flight of Fancy. No longer so perplexed about revisions today. In the early hours of the morning came a moment of clarity. What brought it on? Our upcoming flight to Croatia had been changed from a civilised 12.55 p.m. to an unthinkable 6.25 a.m. I was furious. I shall never fly with Monarch again. It prevented me from sleeping. I had to switch off and change the subject. Out of bad comes good. At 1.00 a.m. I worked out exactly what I have to do with my book. Not the new one, but The Key to Finlac, which I "finished" in August. I now know how to reduce the MS by 40,000 words whilst retaining the heart of the story. That's the theory anyway. I began making notes this morning. As for the recent book? Can I really revise both stories at once? The human brain is an unfathomable thing. Truth can't be revised but it can be found through revision. "I'm afraid, though, I am still quite a long way from being satisfied. The whole thing still gives me the impression of muddled improvisation, and it has grown to an unwieldy size in the process....One of your weaknesses here and elsewhere, may have been the very fertility of your imagination." And this is true of the new book. Rein in the imagination, find the truth of the characters, discover the real story and set it out in clear terms. Back in 1990 when Christopher Reid wrote me that letter, I went for a stomp round the woods to vent my anger & despair. Now I am wiser. I keep the letter close by and listen to what it tells me. You can rewrite a book; it is foolhardy to rewrite history. I always look forward to the task of revision, then immediately long for the carefree days of tapping the keys, meeting the characters listening to their story. But revise I must. Sometimes it feels like raking up leaves in a high wind or chasing a lottery ticket along the seafront. Other times it seems like the plot is almost there, but it cannot quite be recalled, like waking from a vivid dream the details of which are suddenly lost. Then inevitably halfway through the first read comes the loss of confidence and the realisation that you are going to have to write much of the novel over again, and that is like straddling pair of wild horses who want to pull in different directions, whilst juggling three flaming torches. It's an unnerving journey. A read through, spotting immediate faults with the plotting and characterisation. Listing the key things that need to be changed. 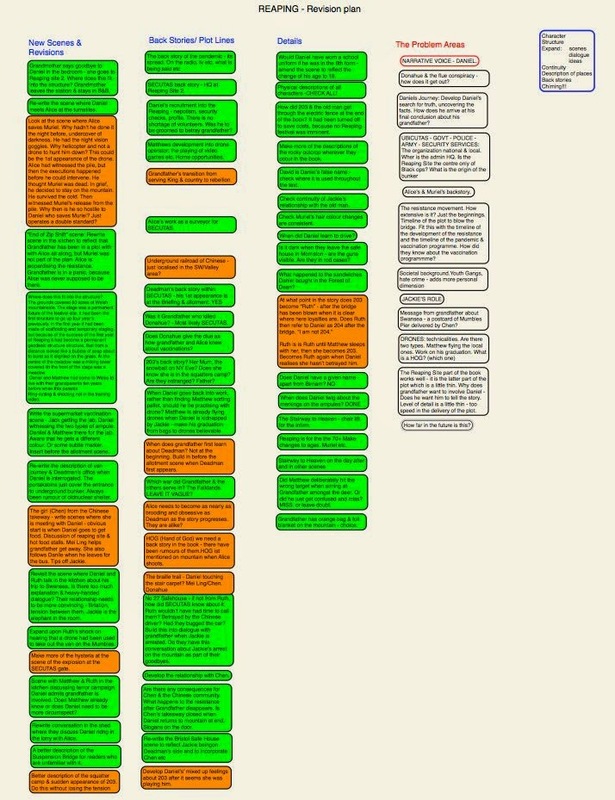 Producing a good plot outline (scene by scene). Re-writing and/or deleting scenes and introducing new characters as necessary. Re-reading and sharpening the plot. Sharpening the prose and checking for typos. Right now though I am staring at two wild horses.